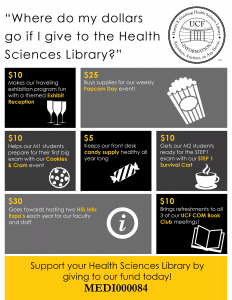 When supporting the Health Sciences Library, use account code MEDI000084. Please make checks payable to UCF Foundation, Inc. and indicate the designation of your gift in the memo section of your check. The Harriet F. Ginsburg Health Sciences Library foundation account supports many of the wonderful programs, events, and initiatives the library makes available for our faculty, staff and students each and every year. Consider making a donation today to support one or all of your favorites – every single gift goes towards better serving our College of Medicine community. We thank you for believing in what we do!